Samsung Galaxy Premier a feature-rich, the Android-powered keeps you connected to everything you love--fast. The handset has a 4.65 inch HD Super AMOLED full touch display which provides a bright display technology that doesn't require backlighting. It lets you enjoy videos with a better quality and 720x1280 pixels resolution. 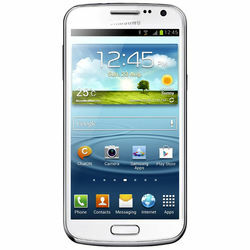 Running on Android 4.1 (Jelly Bean), the Galaxy Premier takes the crown of the most powerful Android device from Samsung thus far. The Android OS has an easy-to-use interface and offers intuitive text input. You can enjoy enhanced application and power management. The Samsung Galaxy Premier comes packed with GPS, NFC, Wi-Fi and Glonass connectivity options that allow you to connect to the Internet. NFC allows faster transfer of files. Connectivity features like Bluetooth and USB port helps you to share files with other devices. The Samsung Galaxy Premier sports an 8 megapixel Auto Focus camera with LED Flash which lets you click images with contrast and quality. There is also a 1.9 megapixel HD front-facing camera that allows video chatting. You can also record videos at 30 fps. Other camera features like multi shot, night vision are also present in the handset. The Samsung Galaxy Premier features an audio player which supports MP3, AAC, eAAC, WMA and RA audio formats. You can also enjoy watching videos as the phone supports MPEG4, H.263, H.264, WMV, RV, DivX, Xvid and VD-1 video formats. This mobile allows you to stack all your favourite songs, movies and pictures as it features a 8/16 GB internal memory which can be further expanded upto 32 GB via microSD card. It runs on a powerful 2100 mAh battery that keeps you on for a longer time.